Brisk polling was recorded till noon on Monday, the final day in the ninth phase of polling in 41 seats in the Indian elections. An average of 66 per cent voters exercised their franchise in the last eight phases. 41 constituencies in three Indian states of Uttar Pradesh, West Bengal and Bihar are voting during the last phase of the parliamentary polls. Over 90 million voters are expected to vote to seal the fate of 606 candidates on Monday. The right-wing Bharatiya Janata Party’s (BJP) prime ministerial nominee Narendra Modi and Aam Aadmi Party (AAP) leader Arvind Kejriwal are both contesting from Varanasi, which goes to polls today. Results are expected for all the 543 seats of the lower house of the Indian parliament on 16 May. 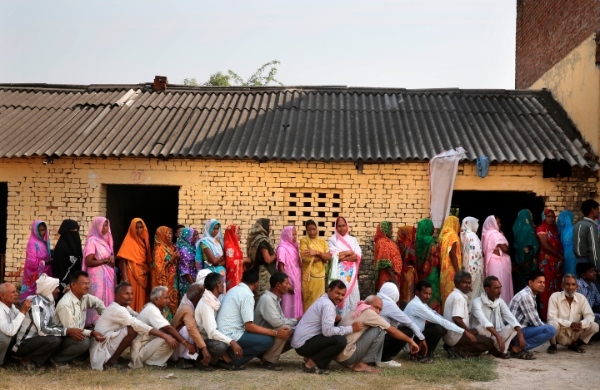 The 2014 general elections in India was spread over 35 days. The Bharatiya Janata Party (BJP) and its allies are widely predicted to win, although they could fall short of a clear majority, say pollsters. In case they fall short of the 272 lawmakers required to form government, BJP would need to cobble up a coalition with new allies. Most analysts are hoping a stable government would likely see a strengthening of the Indian currency. Modi has been accused by rights groups of failing to stop deadly religious riots in Gujarat, the state he governs, in 2002, in which over 1000 Muslims lost their lives. He denies any wrongdoing on his part.